Marine speakers are designed with water-resistant and UV-resistant materials for use in boats, motorcycles, spas, and other outdoor applications. Many of our Marine speakers feature plastic cones and rubber surrounds for optimal durability. These speakers can withstand light rain, moisture and damaging sun rays. It’s the little things that set marine speakers apart. Unlike ordinary car speakers, their tinsel leads and voice coils are protected from moisture to help prevent corrosion. If you already have speakers in your boat, you can simply measure the hole space to figure out what size you will need for the replacements. 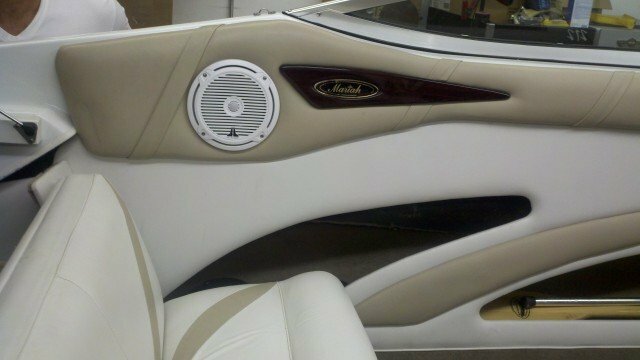 If you do not have speakers in your boat or you want to add bigger speakers, you will have to modify your boat’s panels. Another option is to add Wakeboard tower speakers, a hugely popular marine speaker design. Wakeboard speakers are encased in individual tower enclosures, ready for mounting on wakeboard tower bars. As I mentioned in the Selecting a Set of Car Speakers article, the sensitivity rating is the most important aspect to consider when gauging a speaker’s quality. This rating tells you how effectively a speaker converts power into sound. The higher the sensitivity rating, the more efficient the speaker and the louder it will play given a set amount of input power. This is especially important if you are placing marine speakers in a boat, because you will need these speakers to be loud enough to sound clear in an open air outdoor environment. Therefore, you should look for a pair of speakers with a high sensitivity rating, among other notable features such as RMS power ratings. To be sure, marine speakers are not completely infallible. Water resistant means the marine speakers are protected against moisture. Though they will survive sporadic rainfall and water splashes, marine speakers are not completely waterproof. To illustrate, you cannot completely submerge your marine speakers and expect them to continue to function. When installing your marine speakers, be sure to use waterproof marine speaker wire to safeguard your speakers from corrosion and water damage. Be sure to connect the terminals in phase and make sure that the connections are secure. These tips should help you establish a nice sound for your boat or outdoor application. If you need more bass, you should consider adding marine subwoofers and marine amplifiers to your system.